Ubisoft doesn't want to oversell its Black Flag, but it's expecting great things from next gen.
Ubisoft has had a pretty good 2012, thanks in no small part to its core gaming segment, where sales were up 60%, to €928 million euro ($1.1 billion). Assassin's Creed 3 was a significant part of that sales bump, moving 12.5 million units, both digital and boxed. Looking to the future, Ubisoft has every hope for success for its next entrant in the franchise, Assassin's Creed IV: Black Flag, but doesn't want to oversell its latest title, so it's aiming for "more conservative [sales] targets," according to an investor call. 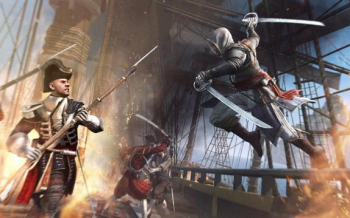 Ubisoft thinks, at least right now, that Black Flag may not sell quite as well as Assassin's Creed 3. Ubisoft certainly doesn't think Black Flag will do poorly. "When we start the year we try to give something that we believe is reasonable [while] still trying to be ambitious," says Ubisoft's Yves Guillemot. "We are actually pushing to achieve more than last year," he added. Though Ubisoft is pitching its targets low, it wasn't prepared to give precise sales prediction targets just yet. Ubisoft's very bullish on next gen consoles - phrases like "mind blowing" and "unprecedented sense of immersion" were used during the investor call - and thinks it is perfectly positioned to make hay when the next console generation shines. "We have the means to master the three key features," says Guillemot, being high quality, regular releases, with integration of social features, features which Ubisoft knows will become increasingly important in the next generation. There was even a hint of a future Ubisoft reveal; Guillemot mentioned a hitherto unannounced new brand and an unannounced franchise due in the current financial year. But as for what those might be, you'll just have to be patient; no doubt Ubisoft has a presentation prepared for a future date.